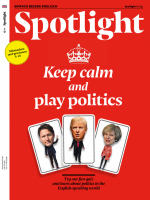 Seit September 1993 erscheint in jeder Ausgabe von Spotlight eine Folge unserer ganz eigenen Seifenoper. Chefredakteurin Inez Sharp entführt Sie darin in ein typisch Londoner Pub namens „Peggy’s Place“. Diese Woche: Wird Spotlights ganz eigener Londoner Pub eine Hauptrolle in einer TV-Serie spielen? Man: Excuse me! Could I have a pint of beer, please? Sean: Sure, what’ll it be? A pint of bitter? Man: Bitter sounds good. I hope you don’t think I’m being rudeunhöflichrude, but is this what you call a typical British pub? Sean: So you’re not from here, then? Man: I’m sorry. I don’t understand. Sean: What I meant was, if you’re asking how British this pub is, then you probably come from somewhere abroad. Man: Ah, I see. This is what is meant by being “indirect” — a very British way of talking. Sean: Now I’m getting confused. But back to your question: yes, I’d say this is your average British pub. Here’s the landladyhier: Gastwirtinlandlady. We can ask her. Peggy, this gentleman here wants to know if this is your typical British pub. Is this what you call a typical British pub? Man: But the name, Peggy’s Place, that isn’t a typical pub name. Peggy: That’s true. It’s kind of a quirkEigenart, Marottequirk of this place. Man: Well, we can change that easily. Man: And would you say you were both typical Londoners, then? Sean: I think it’s about time we started asking the questions. Man: Yes, of course! How very impolite of me. My name is Jan Friedrichs. I’m here from Germany on a recce (UK ifml. )Erkundungsfahrt, hier: (Film) Locationsucherecce. Sean: That means he’s checking out ­places as film locations. Jan: That’s right. We’re filming a Rosa­munde Pilcher novel, and one scene is set in a London pub. Sean: Is that a German writer? Peggy: No, silly! She wrote The Shell Seekers. The book sold millions. She must be in her 90s by now. Jan: The Germans really love her stories — and they love the films we make based on her stories. Sean: So, are the films in English? Jan: No, they’re in German. Peggy: Isn’t that a bit strange? Jan: Not really. It’s what I believe you call “the best of both worlds”. We have beautiful English landscapes — a lot of the filming is done in Cornwall, but with German actors who are known to the audience. Sean: And you’re thinking of using this pub in one of the scenes? Jan: Yes, but of course, it should be the kind of place that Germans think of when they imagine a British pub. Sean: It could be quite fun. Peggy: How many days’ filming are we talking about? Sean: Could we be extraKomparseextras? Jan: We would have to see. There are no speaking parts for British extras. They are mostly done by German actors. Peggy: How many people in Germany watch these films? Jan: A few million for sure. Peggy: And do we get paid for this? After all, we would lose custom (UK)Kundschaftcustom in that time. Jan: Yes, and it could be good promotion for the pub. Peggy: Not if you change the name. Jan: I’m sorry, but the name would be changed anyway. Peggy: Then I’m sorry. There’s no deal. Sean: Peggy!... Excuse us for a moment. I need to talk to my boss.